What book have you read, cover to cover — but for the life of you cannot recall a single detail from within its pages? The question itself may be a paradox, but we'd like to see if you can remember what you've forgotten. Personally, there are two books I've read, and have a vivid recollection of reading, but have retained no memory of the plot, characters or theme. They are C.S. 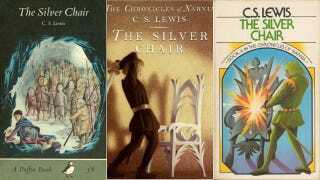 Lewis' The Silver Chair and Nalo Hopkinson's The Midnight Rider. I grew up in a town next to Wheaton College. This means I was legally required to read the works of C.S. Lewis and then be sent on no less than seven different field trips to ogle his preserved writer's desk in the museum section of the campus. I read a ton of Lewis. I have no memory of The Silver Chair. Honestly? I'm OK with it. Nalo Hopkinson's The Midnight Rider is another matter entirely. I read this novel during my final days at college. Unfortunately, I've only retained a few vague details about Granny Nanny. But I do remember enjoying it. I can remember loving the author's names for the protagonist Tan Tan and various universes like Toussaint and New Halfway Tree. So I'm re-reading it. Right now. What book do you need to revisit? Please include the book cover or representative image, plus the title and how long ago you read it.